TransMongolian is a composition of unprocessed field recordings composed in soundscapes. I recorded these acoustic phenomena on my journey through Russia, along Lake Baikal, through Mongolia, China and South Korea to Japan. These countries do not only have very different landscapes and ways of life, they also differ in their sounds, a dimension which more often than not goes unnoticed. The 6 acoustic portraits reflect what I found to be representative of or very special about the countries. 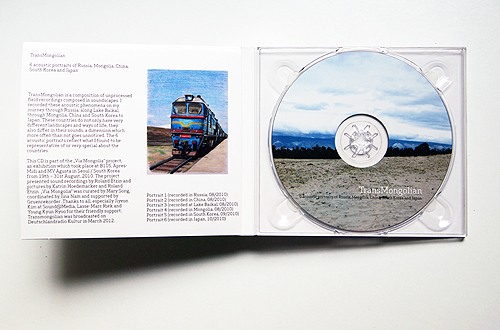 This CD is part of the „Via Mongolia“ project, an exhibition which took place at B105, Apres-Midi and MV Agusta in Seoul / South Korea from 19th – 31st August, 2010. The project presented sound recordings by Roland Etzin and pictures by Katrin Hoedemacker and Roland Etzin. „Via Mongolia“ was curated by Mary Song, coordinated by Jina Nam and supported by Gruenrekorder. Thanks to all, especially Jiyeon Kim at Sound@Media, Lasse-Marc Riek and Young Kyun Ryoo for their friendly support. TransMongolian was broadcasted on Deutschlandradio Kultur in March 2012. The Audio Track “Portrait 6 (Japan)” was on “The Wire Tapper 29” CD with The Wire magazine in July 2012. “TransMongolian” offers up six unprocessed field recording portraits of a journey along Trans Mongolian railway,which runs four thousand five hundred miles between Russian & Japan. Roland Etzin is a German based sound artists/ field recordist who has been working in the sound art genre since the early 2000’s. He’s also the co-founder of the Gruenrekorder label with fellow sound artist Lasse-Marc Riek. “TransMongolian” is Etzins’ first full length recording in six or so years, through his work has featured on several sound art compilations inbetween releases. The album features field recordings made by Etzin in the late summer to early autumn of 2010. Our journey starts off in Russian with the near on twelve and a half minutes of “Portrait one”. This track starts off been built around what sounds like a recording a large enclosed area( a main train hall/ ticket hall? ); with bangng & clunking of work men going on, distant grinding & drillings , and the odd echoing footsteps. At around the five minute mark the hallway recordings thin out, and it now sounds like we’re on the train as we hear a growing mixture of train type sounds: such as electric type droning, rumbling carriage sound, slicing rail sounds, and perhaps the sound of automated doors or stream. Onto “Portrait two” and we’ve now moved in China, and this dead on seven minute track starts with a weird looped & growing mass of chipping textures(which sounds like mechanical birds) & building people chatter. Before dropping into the series of weird vibrating & juddering textures that sound like either someone sliding a squeaking door or someone getting in/out of a boat- these sounds are broken up by brief silences, or distant mechanical tumbling sounds that seem to have almost water-like-rocking-in-a-boat edges to them. The track ends with fading rail scraping sounds. “Portrait three” finds us at Lake Baikal; which runs between the Russian region of Siberia to the south, between the Irkutsk Oblast to the northwest and the Buryat Republic to the southeast- it’s also the most voluminous freshwater lake in the world. The just under ten minute track starts off been built around this weird sizzling/ splashing element that could either originate from water or heated up-then-splashed boiling liquid…or maybe a mixture of both of these-what ever the recording is of it’s one of the most captivating & appealing moments here. At around the mid-way point the track switches to the soothing and detailed sound of water lapping against the shore. Onto “Portrait Four”, and this just under six minute track finds us in Mongolian. The track starts with a fairly muffled a vague mixture of running footsteps, bug buzzing, distant human sounds & dog barking. Fairly soon the high up whoosh of an airplane, closer people chatter, and more bug buzzing can be heard, before we moving into a series of appealing wooden step like creaking’s & bowings. “Portrait Five” was recording in South Korea, and comes in at just shy of the eight minute mark. This track starts off with a mixture of carriage creaking, steaming hissing & weird treading water/wood type sounds. Around the two minute twenty mark we move into this mixture of weird panning hissing sound & amassed sound of chattering birds. Then latter on we move onto more station like sounds with ringing bells, creaking trains, and almost harmonic amassed tumbling’s- which I’m guess is some large glass or metal recycling skip been empted. Lastly we have the just under ten minutes of “Portrait Six”,which finds us in Japan. And this starts with a amassed sound of arcade game machine melodies, cheesy lift music & darts of dance music ect… I guess Etzin was making his way through a large gaming arcade. Around the three minute mark these sounds fade, and a churning/ buffeting texture grows- it sounds like it could be recorded in the back of a small boat that’s chugging along a quiet waterway. By the 5th minute distant bird type chatter has been added along with the sound of a passing train, before we move into the slowly growing sound of approaching footsteps. “TransMongolian” is a most satisfying & appealing field recording album which finds Etzin keeping your attention through-out as you follow him on his sonic journey. He has a great ear for intriguing and interesting sound, and quite often you can’t quite figure out exactly what it is he’s recorded which adds another rewarding layer to the release. TransMongolian meanwhile is a far more listener friendly release. Traversing the 4,500 miles between Moscow [I think?] and Japan, Etzin captures the sound of wheeltappers at work in train sheds, noisy Pachinko parlors, sleepy train carriage rumbles, the creaking of leather straps on boats, the smooth whoosh of the Shinkansen, the chirp of nocturnal insects and cheery fairgrounds … I could go on, the variety of sounds recorded by Etzin seem almost without end. The defining pleasure to be had from this release is the way in which it captures the slow process of travel itself. The enclosed booklet contains pictures drawn by Etzin’s traveling companion René Seifert and none of them show planes or airports so I’m guessing this was an over land and sea trip? Water, rail and feet feature heavily: the crunch of gravel underfoot, the clank and groan of a train carriage, the lapping of the water against the side of a boat and then there’s the weather, hard to capture sunshine on sound but rain and wind make their ever fateful appearance, all of it adding to the ambience and the feeling of actually slowly moving from one place to another. Deep down I was jealous of Etzin and Seifert and the fact that they had the time to make this trip. I doubt my more humble travels would return such rewarding material but you never know. I’m taking my digital recorder to Northumberland next year just in case. Subtitled, ‚6 acoustic portraits of Russia, Mongolia, China, South Korea and Japan‘, this set of atmospheric recordings represents field-recordings made between August & October of 2010. The 6 provide a documentation of life on the rail journey both through the sound of the transportation itself (on tracks 1 & 5), the stops along the way, the liquidity of the lake visited on ‚Portrait 3‘ and the ambiences of the travel itself; the amorphous clatters and clangs and the Frankenstein musicality of machinery in use. It must be said here that this isn’t the most effective of Gruenrekorder releases. For the most part the sounds are just too ambiguous. They have no real sense of place. The trains could easily be the 2:30 from here to London, the tides of Lake Baikal could be the beach at the bottom of the hill from my house. The insect life of ‚Portrait 5‘ though brings a definite sense of the exotic. As a whole it’s an interesting set of sounds but only in the sense of it’s musicality. As an examination of a journey or an exploration of place it is, for me at least, slightly less successful. Russie, Mongolie, Chine, Corée du Sud et Japon : voilà où nous emmène ce TransMongolian, une oeuvre de field recordings que l’Allemand Roland Etzin a écrite pour la manifestation « Via Mongolia » en 2010. Dans l’ordre des pays cités, la musique du réel recompose le voyage au point de brouiller les cartes. En effet : le réseau ferroviaire russe sort-il vraiment du grand hangar dans lequel, au début du CD, résonnent des voix et de la ferraille ? Qu’importe ! En train, en marche, en route ! A la fenêtre, on verra passer des insectes géants et des enfants s’amusant en Chine, des plongeurs et des hommes en barque sur le Lac Baïkal, des femmes tranquilles qui attendent la fin du monde en se balançant en Mongolie, des oiseaux caméléons en Corée du Sud et des personnages de jeux vidéo qui ont pris formes humaines au Japon. D’impressionnantes découvertes à faire entre ses quatre murs avec à portée de main deux livres de chevet : Voyage autour de ma chambre et Un barbare en Asie. Все-таки некоторые «экспириенсы» лучше доверить другим людям. Лично я, стоит мне только оказаться в поезде дальнего следования, начинаю грезить о романтичной профессии проводника – правда, уже спустя сутки я дико жалею, что оказался на этих жестких полках возле металлического стола на одной ножке, на котором дребезжат вечные стаканы в подстаканниках. А вот Роланд Этцин провел в пути гораздо больше времени – и ничего, как истинный художник, он смог перевести банальности (хотя для иностранца выбранный маршрут явно не банален) долгого путешествия в путевые заметки, приявшие в итоге одну из выразительных форм современного искусства. Путешествие по Трансмонгольской железной дороге начинается с того, что до нее надо еще как-то добраться. Путь Роланда начинается с Москвы (диск дополнен карандашными рисунками, выполненными с детским, наивным взглядом на мир, и уже первый из них запечатлел Кремль), с вокзала. Точнее, с зала ожидания, где мало народа (запись сделана явно не в столичном вокзале, это какой-то уже далекий и куда как менее населенный город), много пространства и где продолжается вечный ремонт. Затем мы, вслед за автором, попадаем в вагон и можем вновь пережить то очаровательное в своей бессмысленности чувство восторга, когда огромный железный монстр, громыхнув где-то прямо под нами, начинает двигаться, медленно набирая ход. Путешествие началось, и будет оно долгим, растянувшись от России и до Японии. Мимо озера Байкал (посидим на его берегу и услышим, как тихо, вкрадчиво плещутся у наших ног его волны), по бескрайней монгольской степи (погостим в скрипящем на пронизывающем ветру домике кого-то из местных старожилов), минуя десятки пустынных полустанков, оглушающих своей абсолютной тишиной. Китай, Южная Корея – это финал пути, экзотические точки на карте, полные шума, гомона, сутолоки, звуков цивилизации, которые в финальном треке сливаются в радиокакафонию и абракадабру спятившего оркестра. От этого хочется сбежать, остаться один на один с привокзальной тишиной, слушая лишь стрекот насекомых, ставший таким привычным металлический гул остановившихся на ночевку локомотивов, да скрип гравия на насыпи возле железнодорожных путей. Кажется, что одна из целей альбома – передать масштабы стран, которые промелькнули за мутным окном вагона. Наверное, эти огромные пустые территории кажутся чем-то невероятным обычному европейцу, их подавляющая, раскинувшаяся до горизонта тишина и подавляет, и зовет за собой. Ощущение этого очень хорошо передано в этих шести звуковых портретах, тихих зарисовках из непонятной и загадочной, живущей, кажется, вне привычного для всего остального мира времени Азии. 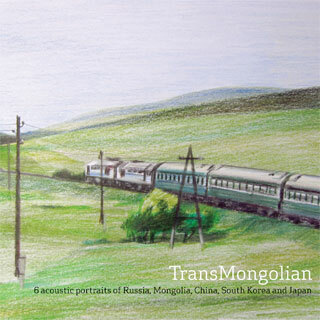 Roland Etzin’s ‘TransMongolian’ is a series of acoustic portraits recorded during a three month journey across Russia, China, Mongolia, South Korea and Japan. Given the sheer distance covered by Etzin during the summer-autumn of 2010 and his encounters with such a diverse range of cultures and associated ways of life, I imagine he would have ended his travels with a recorder brimming with field recordings. For ‘TransMongolian’ however, Etzin decided to bring together just six recordings that, to his ear, represented the countries through which he had travelled and, most importantly, listened to. Each portrait includes some element of movement and travel, and given that much of this journey seems to have been carried out on the famous Trans-Mongolian Railway, mechanical sounds become a regular occurrence. The first portrait, recorded in Russia, is the most mechanical in nature, with the whole track appearing to take place in a station and then onboard the train. Aside from a few footsteps, muffled coughs and distant voices, Portrait 1 dedicates itself to the sounds of the chosen mode of transport which is a great way to start. As we progress through the remaining portraits, other sound types begin to emerge. Portrait 4, for example, was recorded at Russia’s historical Lake Baikal and is dominated by the sound of water, taken from both above and beneath the surface. Over the course of 10 minutes, this piece moves from a gentle hydrophone recording to a vigorous example of breaking waves on the lake’s shoreline. In contrast Portrait 5, recorded in South Korea, finds its voice in both the natural and the industrial world, with heavy metallic movements sitting comfortably alongside an intense cicada chorus. The Mongolian portrait (track 4) is perhaps the most striking. From a gentle, rural atmosphere comes the sound of approaching hoofbeats; a reminder to us that traditional methods of transport still exist in some parts of the world. This seemingly idyllic setting is then invaded by what sounds like a plane passing overhead. Our journey comes to an end in Japan where Etzin throws us into the noisy, in your face world of amusement arcades. This was completely unexpected and in stark contrast to the other portraits. A final train journey is undertaken until all that is left is the sound of solitary footsteps walking on a rough path, returning us to the oldest and most traditional form of transport for our species. ‘TransMongolian’ is a personal snapshot of the sonic experiences of one individual during the course of a journey that took three months to complete and crossed five different countries. Should you or I have completed the same journey, our interpretation of the signature sounds of these places would of course have been quite different. Some sounds are so striking and naturally cause the ears of field recordists to prick up, that I’m sure certain elements of Etzin’s portraits would continue to surface again and again. […] By comparison, Roland Etzin’s TransMongolian is rather straightforward in its presentation of six acoustic portraits of Russia, Mongolia, China, South Korea, and Japan. Little textual detail accompanies the release, making it one to experience almost solely on sonic grounds alone. Also issued as part of Gruenrekorder’s Field Recording Series, the fifty-three-minute release, which originally was broadcast on Deutschlandradio Kultur in March of 2012, comes with a lovely little booklet that displays illustrative renderings of landscapes by Katrin Hoedemacker. Etzin, an audio artist and Gruenrekorder co-founder, collected unprocessed field recordings for the project as he made his way through Russia, along Lake Baikal, through Mongolia, China, and South Korea to Japan. What results is a highly personalized series of contrasting portraits that capture what Etzin deemed to be representative of the locales. A given piece involves many episodes, with each flowing seamlessly into the next. Identifiable sounds, such as hammering and the clatter of a moving train in the Russia portrait, appear alongside parts containing sounds of a more indeterminate nature. The smears and crackle that introduce the Lake Baikal setting appear to be water-derived, though without the clarification provided by the title detail one might be harder pressed to identify the originating sound material, even if the subsequent passages of gurgling and crashing waves make the water connection explicit. The China setting teems with activity both natural and industrial, as voices and engine sounds intermingle, whereas the Mongolia one, dotted with buzzing flies, creaks, and a barking dog, is more sedate and less busy. The South Korea portrait alternates between the violent clatter of machinery and natural sounds of exotic birds and insects; the Japan piece begins with a dizzying swirl of fragmented melodies and voices before moving onto a less frenzied episode of engine thrum, insect chirp, and trudging footsteps. One might best think of TransMongolian as an evocative documentary film for the ears. And we’re off once again, this time on a six-part journey undertaken in 2010 across Russia, China, Mongolia, South Korea and Japan, Etzin making the sound recordings, Hoedemaker contributing drawings in what seems to be colored pencil or pastels. In this case, the recordings (as near as I can tell–I could be wrong) are untreated. They’re not travelog-ish, no train engines or whooshing winds, more moments that happened along and/or were chosen afterwards by Etzin (though the one from Lake Baikal is…watery). So you’re more than usually cognizant of the choice factor: why this and not that. And, by and large, Etzin’s choices are reasonably engaging, often obscurely sourced, bearing textures that are sharply drawn, the sonic equivalent of a silver gel print form the Adams (Ansel) school). Still, things quickly begin to pall–Baikal’s waves become somewhat numbing, the nighttime in Mongolia is replete with insects and train sounds (nice contrast of the shrill and deeply rumbling), a festival here, air rushing in Japan. As is often the case, there’s nothing „bad“ here; how could there be? But also nothing that seizes the ears, that makes me wish I’d been there, that, essentially, I can’t reproduce for myself at any given moment, with the materials close at hand. Apologies for the griping nature of this post….listeners with a bent in this direction will surely find much of value here. :zoviet*france: present A Duck in a Tree, a 60 minute continuous mix of some of the best genre-refusing, zero BPM, hypnotropic and maximinimalist recordings that have grabbed their attention.